Click here to buy, or visit my sales page at www.momof4.com. The intro and chapters below have been edited since I originally posted this last year. You will find a slightly different version in the completed book. You can view the intro and first two chapters for free on Amazon. Scripture quotations are from the Holy Bible, New International Version (NIV) copyright @ 1978 by New York International Bible Society. Published by permission. For more information about the Feingold Diet visit www.allnaturalmomof4.com or www.feingold.org. For practical tips and Feingold recipes, like All Natural Mom on Facebook at www.facebook.com/allnaturalmom. free) diet. I wrote about autism, vitamins, allergies, and other diets. the diet that could be easily shared with friends and family. of your family for the better. take those first baby steps to better eating. Everyone has to start somewhere. arrive at truly healthy eating. Many Feingold members do just that. starting a new diet. I am not giving medical, financial, or legal advice. colors (dyes) like red #40, yellow #5, and blue #1 to name a few. Feingold also eliminates artificial flavors and certain preservatives such as BHT (Butylated Hydroxytoluene), TBHQ (Tertiary Butylhydroquinone), and BHA (Butylated Hydroxyanisole). Feingold also addresses the issue of salicylates in stage one of the diet. Salicylates are the natural chemicals that plants produce to ward off bugs and diseases. They are found in many fruits and other foods and can cause many adverse reactions. (4) Stage one is the first six weeks on the diet. During this time, you will stay away from all high salicylate foods. After six weeks, you can add in one new stage two food at a time to see if your child reacts (more on this in chapter five). fee (more on this in chapter six). symptoms is the avoidance of harmful additives. decisions with what we put into our bodies on a regular basis. eat corn syrup or MSG but it’s not an every-day thing. family. If you don’t join Feingold, you can still make changes for the better. Studies on rats and mice have been done on each dye individually, but what about the mixture of several dyes? Ever read the ingredients on a bag of Skittles or Lucky Charms? Blue, red, yellow dyes all mixed together in one food. The CSPI study also showed that no long term studies have been done on the effects of ingesting dyes. Most of the studies recorded reactions over a two year period, and some dyes were tested for even shorter periods. Most people did not start eating larger amounts of dyes until recent decades. Fifty years ago, people would cook mostly from scratch and their kids were not eating dyes every day. The study also did not include an in utero phase, meaning we do not know the effect dyes have on an unborn baby. The FDA has limits on the amount of carcinogens allowed to be used in one individual dye. (7) Those limits ensure that the carcinogens in the dyes will not pose a lifetime of risk greater than one cancer per one million people. However, there are no guidelines for consumers on the total amount of these products to consume each day. What amount of dyes can be “safely” ingested each day? What if your child is eating multiple dye-laden products each day and what if they do that for years? Is there a cumulative effect of eating all these dyes together over long periods of time? Also worth noting that the FDA’s limits were set based on 1990’s dye usage data, when dye usage was 50 percent lower. The limits were also set based on an adult’s bodyweight, not a child’s. Let’s take a look at a typical child’s day. For breakfast, they have a strawberry yogurt which has been artificially colored with red dye (this may or may not be listed on the ingredients because their supplier of strawberries may add it). They brush their teeth with brightly colored toothpaste. They go to school and get hot lunch where they have red-dye laden fruit punch containing red dye. After school they grab some Nacho Doritos ® which contain yellow and red dye. For dinner, your child has macaroni and cheese containing yellow dye. After dinner, your child goes to soccer practice and grabs their favorite brightly colored sports drink which contains blue dye. By the end of the day your child has consumed a rainbow of colors. In 2011, the Feingold Association and a few other agencies tried to convince the United States government to at least put warning labels on dyes. (9) It failed to pass by a couple of votes. I guess we’re getting there. Hopefully we’ll catch up to other countries one day and ban them altogether. our gasoline, diesel fuel, asphalt, and tar. Mmmm, give me some of that. Some people don’t want to know the ill-effects of dyes because they want to keep enjoying their favorite foods. I can understand that and that’s why I like Feingold. There is often a natural substitute for a favorite food and if there isn’t, you can always make it. I don’t feel deprived at all by eating a chemical-free diet. I feel empowered. We also need to teach all of this to our kids. Let kids learn in school what’s actually in those “fruit” snacks they are eating. When people (including kids) are informed, they are more likely to make better choices. When my son was little, he would tell his friends as they were eating brightly colored candy, “That causes cancer you know.” Of course they didn’t receive this very well. One girl told him her mother would never feed her something that would give her cancer. Well, dyes are carcinogenic. Most people just don’t know this. In addition to being linked to cancer, dyes can also cause hyperactivity and behavior issues in many children. This information is more commonly known thanks to recent media coverage. the food additives he eats. and could even be causing behavior problems in children who’ve never had them. need to know about some hyper ingredients. colorings had some increased level of hyperactivity. department at the University of Chicago’s Comer Children’s Hospital. use and many doctors recommend to this day. eliminated it from his diet she noticed an almost immediate difference. “Within two days hyperactivity was down 75 percent,” she said. The hyper ingredients are found in everything from beverages to baked goods. extracts so Cody can still eat foods he loves — even cheese curls. attention to what they eat,” Stein said. with additives if they see changes in their child’s behavior. food dyes, especially yellow 5 and 6. © MMIX, CBS Broadcasting Inc.
natural flavor, but in the end, there is nothing natural about it. effects. Below is a small sampling of what we do know. Feingold shopping guide to see if it truly is natural. was enough for me. We avoided them. day is simply one order of magnitude below the lethal dose in animals. had offspring that slept less, were more irritable, and showed slower learning. stomachs. Both BHA and BHT are toxic to the liver and kidneys. Remember, humans are animals too. we could find that still had the old ingredients. McDonald’s are cooking their fries and other foods in oil preserved with TBHQ. you can avoid all these additives. started walking, he started running…and never stopped. He ran everywhere, literally. that would put most two-year-olds to shame. he would finally just collapse and go right to sleep. how to conceive the gender of your choice. It worked! all, he wasn’t a bad kid. tried everything Dr. Dobson said and nothing worked. I shoved it under my bed. a book out there that had my kid figured out. up, wondering what he might have done that day. kids and honestly, no one was asking. It’s not that he was malicious in nature. hurting other kids if I wasn’t watching him closely. was I to quench his free spirit? praying for him after they left. Who wouldn’t? for a child, boy or not. older now, and maybe it was just the teacher. he had the same behavior problems as before. life was going to be very short-lived. Africa, they had no behavioral issues. All of sudden they were extremely hyper. She said she had linked it to the red dyes in the American foods they were eating. prideful. 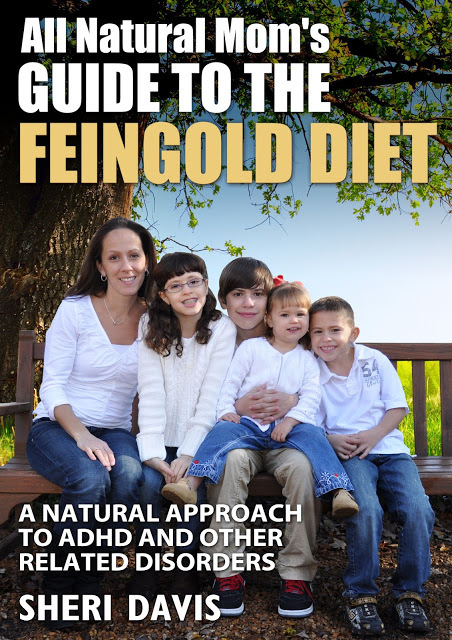 So, I put the Feingold Diet out of my mind. tried to “limit” his consumption of red dyes. processed food? What was I supposed to feed him? intelligent. Why couldn’t he control himself? dye and hyperactivity” on the Internet. I came across the Feingold Diet again. shopping guide, a fast food restaurant guide, and a ton of reading materials. I was very impatient. I had to wait about two weeks to get my materials. more day. I couldn’t wait to get started! ….Thanks for reading! Look here for the completed e-book coming August 21st, 2014 to Amazon! of Disease, 1982; 1 (2-3):153-65. Accessed at http://www.feingold.org/bio-medjournals.html. 6. Cabot, Sandra. The Liver Cleansing Diet. Glendale: S.C.B. International, 1997. 7. “Food Dyes: A Rainbow of Risks.” The Center for Science in the Public Interest (CSPI). www.cspinet.org. Additives Could Be Making Your Kids Hyper.” 02/08/11. CBS News. www.cbsnews.com. From Cow Dung.” 03/06/06. www.terradaily.com. Preservative Should Be Avoided.” 2/14/11. www.naturalnews.com.